Hillsboro’s Luke Magulac throws a pitch in a tournament game against Gallia Academy during the OHSAA District Tournament in 2018. The Hillsboro Indians varsity Baseball team and Head Coach Matt Garman are anticipating the start of the 2019 season and are looking to make noise in the Frontier Athletic Conference despite losing five players to graduation following the 2018 season. The main reason the Indians are optimistic is the return of all of the starting pitchers from last season including Seniors Ethan Watson and Ethan Humphries and Junior Luke Magulac. 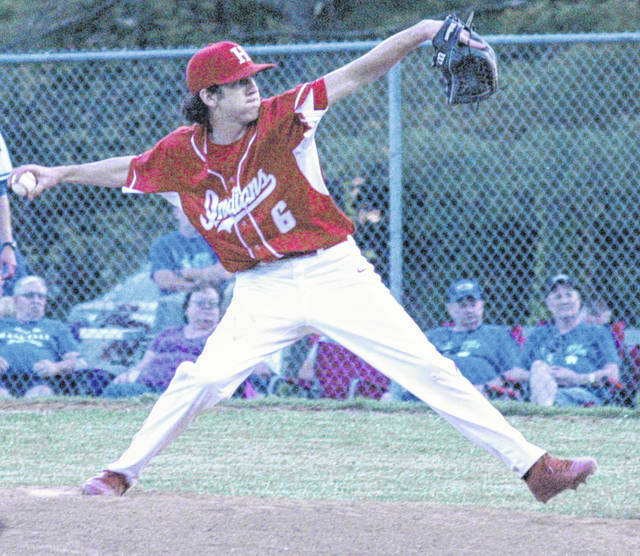 The Indians finished 14-12 overall last season and rattled off three consecutive tournament wins before falling to Circleville in Ahtens and Garman thinks that experience will be helpful for the returners this season. The experience that the team gained during it’s tournament run will be tempered by the fact that five of the key contributors on that team are no longer available.